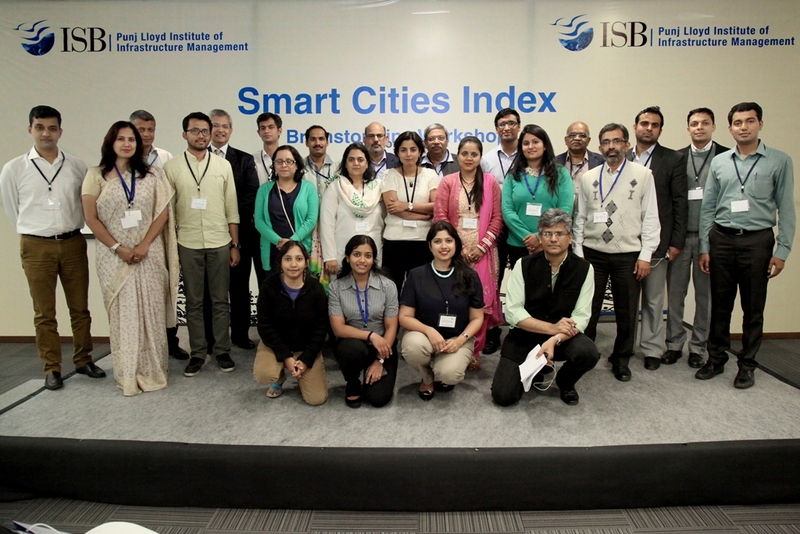 Indian School of Business’s (ISB) Punj Lloyd Institute of Infrastructure Management conducted a two-day workshop to discuss various aspects of the Government of India’s 100 Smart Cities Plan. One of the objectives of the brainstorming at the workshop was also to pave the way for a Smart Cities Index of Indian cities. Gaurav Dubey reports on the proceedings of the workshop that was held at the Mohali Campus of ISB. India is projected to add 404 million to its urban population by 2050, against its current population of 377 million (as of 2011), effectively more than doubling up the number of people that will live in its cities. They will need to be provided housing, water, employment, education, healthcare, entertainment, and a host of other services so that they can lead a good quality of life. It is in this context that the ISB through the Punj Lloyd Institute of Infrastructure Management has mooted developing a “Smart Cities Index”. The Institute’s foray into work on smart cities, starting with this research on ranking smart cities, is concordant with the Government’s policy focus and priority on developing “100 smart cities” to meet the challenges of growing urbanisation in India and equipping them to become the engines of economic growth. A Smart Cities Index would help compare cities in terms of the quality of life that people can enjoy in these cities. An index of this nature would not only help compare cities, but also allow investors to decide where they would like to set up business and people to decide where they would like to live. The purpose of the workshop was to bring together various leaders from the academia and industry that are engaged in different infrastructure sectors to brainstorm on the factors and indicators that would go into such an index. The workshop was attended by an optimal mix of top leaders and participants from corporate entities such as Infrastructure Leasing and Financial Services (IL&FS), Punj Lloyd Group and Solar Energy India Private Limited, Industry Associations such as Confederation of Indian Industry (CII), Multilateral agencies such as the World Bank, NGOs such as Embarq and think-tanks / academic institutions such as the National Institute of Urban Affairs (NIUA), CEPT University, Institute of Urban Transport (IUT), Future Cities, C-Quest, Next Wave Global Solutions and NICMAR, in addition to participants from the Bharti Institute of Public Policy and Max Institute of Healthcare Management of ISB. The workshop began with a short presentation and briefing by Dr O P Agarwal (Executive Director, Punj Lloyd Institute of Infrastructure Management) on the context and purpose of developing the “smart cities index”. He pointed out that while there is no consistent definition of a smart city, there is a need to find a definition that is relevant to the Indian context and needs, and the index itself can contribute to attaining that contextualised definition. Thereafter, the participants were split into groups and taken through stages to brainstorm and come up with the broad aspects, characteristics and indicators that would go into the index. is desirable for compatibility with global indexing systems of smart cities while the contextualisation is critical to reflect the needs and conditions of Indian cities. Therefore, in keeping with Boyd Cohen’s smart cities index endorsed by the Smart Cities Council as well as an earlier study that ranked smart cities in Europe2, six broad aspects of a smart city were agreed upon through extensive deliberations. These aspects are “smart economy”, “smart living”, “smart people”, “smart governance”, “smart mobility” and “smart environment”. “Smart living” shall comprise equitable access to basic services and utilities (such as housing, water supply, power supply, solid waste management, sewerage and drainage), education, healthcare facilities, a safe environment, and security for vulnerable groups (including physically disabled, children and old people) as well as adequate focus to city’s heritage elements which is often crucial towards the city retaining an identity for itself. Indicators would need to be carefully selected for each characteristic so as to also account for quality of life and not just reflect the quantitative provision of services. “Smart governance” shall include ease of dealing with the city administration (including all elements of e-governance and open data), ease of participation with city administration including use of technology and new media platforms for citizen engagement (such as for finalising a city plan, a transport project or other initiatives that affect the city’s populace), existence of a robust framework for city planning as well as for disaster prevention and management, adequate provision of public sanitation, public waste management and storm water drainage system, gender participation within city governance, financial sophistication of the city agencies and the extent of devolution of powers to the same by the State Government. “Smart economy” shall include access to gainful employment, ease of doing business in the city (in terms of Government procedures and regulations), gender participation within the city’s economy, diversity within the city’s economy (so as to avoid a disproportionate reliance on a single source of employment) and the quality of employment including labor conditions and labor productivity. “Smart people” essentially reflects the demand side and recognises the philosophy that citizens contribute significantly to making their city smart-er. Thus, it shall be characterised by factors such as education level of citizens, the level of mutual respect and tolerance level manifested within them towards each other, the preservation of cultural values within them, the degree of innovation and entrepreneurship within the local population, technology literacy of the citizens and the extent of their engagement with the local government. “Smart environment” is characterised by access to nature (such as parks, recreational areas, etc. ), a pollution-free environment (including air and noise pollution), conservation of biodiversity and use of sustainable practices (in terms of energy conservation, recycling and reuse, etc.). “Smart mobility” is characterised by equitable access to transport facilities (including the qualitative aspects such as average travel time and cost), regional/ national and international connectivity (through bus, rail or air), safety of passengers and commuters especially for women and a tourist-friendly transport system. The groups concurred on the point that availability and quality of data may in part determine the indicators that are chosen to measure each of the characteristics for the six aspects as explained above. It was however, agreed that a generic user perception/ satisfaction survey could be conducted to plug data gaps. In keeping with Boyd Cohen’s smart cities index endorsed by the Smart Cities Council as well as an earlier study that ranked smart cities in Europe, six broad aspects of a smart city were agreed upon through extensive deliberations. These aspects are “smart economy”, “smart living”, “smart people”, “smart governance”, “smart mobility” and “smart environment”. The Punj Lloyd Institute will develop a draft index based on the deliberations of the workshop within 4-6 weeks and through further consultation and collaboration with interested participants from within the workshop and beyond. This draft index will contain the finalised set of characteristics defining each of the six smart city aspects and a set of indicators to measure each characteristic. A second larger workshop including the original participants would be held, possibly in Delhi, to discuss the draft index. A discussion on weightages for the six aspects in the index will be carried out during the second workshop after the draft index has been framed. Pilot cities may be identified and data collection exercise may be conducted for them to validate and verify the feasibility and utility of using the index for Indian cities.